Accurate response and excellent mid frequency fidelity makes The Rock a rare chunk of reality. Excellent mid frequency detail and depth. Fast and tight transient articulation. Smooth un-hyped frequency response. Some may prefer more control options. UK distributor Unity Audio has paired up the amplifier talents of Tim Di Paravicini (Esoteric Audio Research) and the acoustic know-how of Kevin Van Green to produce their dream nearfield monitor, The Rock. With a Corian-front baffle, ribbon tweeter and aluminium foil fronted woofer, The Rock possesses a unique look somehow reminiscent of 1950s sci-fi, but one suspects the sound may be a little more modern. The Rock is a sealed cabinet design, as opposed to the more common ported bass reflex monitors that promise (though often fail to deliver) bass extension with higher power handling. 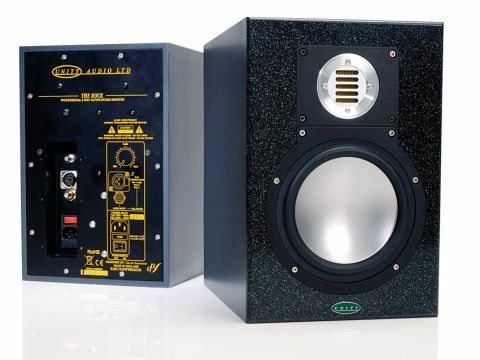 Though the closed cabinet requires more amplifier power per dB SPL compared to a ported design it has a physical advantage in relation to time domain response, which can translate into greater clarity and transient accuracy. Using a high density material like Corian for the front baffle reduces damping effects that can hamper this accuracy. The amplifier efficiency shortcomings of the closed cabinet have been addressed by the bespoke bipolar system (75W LF, 25W HF through custom wound transformers) courtesy of EAR, which adds its own Kitemark of quality to The Rock. The folded ribbon tweeters are rated with an upper frequency cutoff of 50kHz, which may sound silly but it means that no attenuation or significant phase shift in HF response should occur within the human hearing range. The design decisions belie a passion for clarity, which is only reinforced by the Spartan control options. Alongside the XLR and RCA inputs there is only the power switch and gain knob (i.e. input attenuator). This fundamental choice to avoid the trend for EQ/room 'tuning' adjustment parameters speaks volumes about the aim behind The Rock: maximum accuracy, minimum phase shift. The Rock monitors instantly impress with their excellent mid frequency accuracy. The depth of the soundstage is striking, simultaneously rendering delicate reverb tails audible while maintaining a fast transient punch. No detail seems to get lost, which is why their press release declares them as 'brutal'. In the studio, a good off-axis response impressed more than we expected considering how simple and un-sculpted the front baffle design is. The stable stereo imaging doesn't seem to suffer from major phase shifts as the listening position is changed, though as with all monitors, time spent on positioning will get the best results. The amplifiers have plenty of headroom for the drivers/cabinet they power and in a moderate sized space (up to 25m²) these will deliver undistorted clarity within sensible SPL boundaries. Where highly accurate mid frequency response is required these monitors do extremely well. Harmonically complex material can be quickly assessed and any shortcomings easily spotted - no mid-band masking here. Tracking is well aided by the excellent transient response and detail making mic choice and placement subtleties easily apparent. In mixing, they make light work of EQ cuts to separate clashing mix elements with small relative level changes easily identifiable. Excellent transient reproduction and smooth frequency response are (or should be) the bottom line in monitoring and in The Rock one can find these, and at a pretty decent price too. Monitoring is as subjective and trend-prone an area as any other class of audio equipment, but every so often a product bucks these trends and presents a slice of reality. The Rock monitors are one such slice. You could easily spend twice as much and yet hear less, and for the same price one would be hard pushed to find as true a monitor.